Illustrate a typical corporate deployment, with the most common types of sites represented. The two samples differ only in the mode of authentication that is implemented. Describes and illustrates the services architecture, including common ways to deploy services in your overall solution design. For more information on designing and deploying hosting environments, see the following: White paper: SharePoint 2010 for hosters (SharePoint Server 2010). Walks through primary architecture design decisions for search environments. Illustrates supported architectures for deploying Microsoft SharePoint 2010 Products geographically. For more information, see Global deployment of multiple farms (SharePoint Server 2010). Microsoft Business Connectivity Services are a set of services and features in Microsoft SharePoint Server 2010 and Microsoft SharePoint Foundation 2010 that support integrating data from external systems into solutions based on Microsoft SharePoint Server and Microsoft SharePoint Foundation. 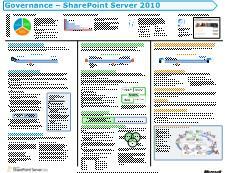 This model poster describes the architecture of Microsoft Business Connectivity Services in SharePoint Server 2010 and provides information about how to create solutions that are based on the service. Helps you understand the in-place, database attach, and hybrid approaches to upgrading from Office SharePoint Server 2007 to SharePoint Server 2010. Explains the methodology for testing the upgrade process before upgrading from Office SharePoint Server 2007 to SharePoint Server 2010. Covers upgrading services from Office SharePoint Server 2007 to SharePoint Server 2010. Covers the process for and considerations to keep in mind when you upgrade farms that share services (parent and child farms). Covers an overview of business intelligence in SharePoint Server and provides you with the following information. An overview of each business intelligence service and when you might use the service. Architecture for application of the business intelligence services and how they work together in a topology. Describes the Microsoft SQL Server databases on which SharePoint Server 2010 runs. Illustrates how to develop a governance plan that includes IT governance, information management governance, and application management governance. Illustrates Duet Enterprise architecture for both the SAP and Microsoft environments, with detailed explanations of each area. Shows the sequence of actions performed by Excel Services in Microsoft SharePoint Server 2010 when it refreshes data in a data-connected Microsoft Excel workbook that is being rendered by Excel Services. Use this flowchart to better understand how Excel Services refreshes data or to troubleshoot data connection errors from Excel Services.